The Prius doesn’t have a key in the traditional sense. If the 12V battery is dead, there is a metal key to open the driver’s door, but only to gain access to the hood release, which allows access to the jumper points. (The metal key is also necessary if the battery in the unlock remote is dead.) To get anywhere (i.e. start the car, or “ready on” in mechanics’ speak) requires a wireless transmitter. In fact most modern cars have a transmitter chip in their keys for deterring theft, but Toyota took the next step by removing the act of turning a key in an ignition cylinder altogether. This new paradigm—of pushing a button to start a car—exemplifies the Prius’ departure from the status quo and its appeal to the next generation of drivers. 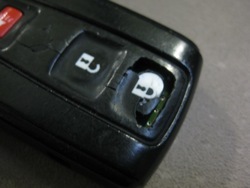 The Gen 2 Prius (model year 2004-2009) uses an integrated key “fob” that combines a lock/unlock remote with a chip to authorize driving. The keys, like their corresponding cars, come in two flavors: “smart” and regular. The regular kind require physical effort by the driver to communicate, by pressing buttons on the remote (for lock/unlock) and inserting the key in a slot to start (for proximity to a tickler that electronically asks the key for its code). This does not require a key battery or the car’s ability to detect a key outside the slot. Thus regular keys (and non-smart vehicles) are less expensive. “Smart” keys transmit several feet and communicate with receivers implanted in various places about the car. (Over the years Toyota has worked to remove “dead spots” where the Prius suddenly thinks the key is missing.) A huge convenience, smart key allows total functionality while the fob stays in your pocket or bag. The act of unlocking a door simply by touching the handle supports the impression that the Prius is an intelligent car. My mom once likened the feature to a loved one reaching across the seat and unlocking the door for you. But, like all technology, increased sophistication entails higher cost and potential for trouble. Without the magical fob, you are stranded and wishing for the days of other loved ones: classic cars, simple repairs, and locks that can be picked (or hot wired). Worse still is the prospect of losing all keys and needing to reprogram the car to accept you again. Prius keys vary slightly in price depending on functionality. Each have dedicated onboard systems: computers, components, and modes for programming. 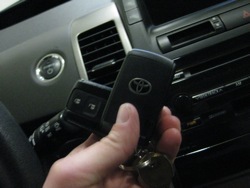 For reference, smart keys have a silver Toyota emblem on the back, the others have a black one. Replacement fobs are not cheap. New from the dealer exceeds $200; seekers are often tempted by eBay and fobs with no guaranteed history or functionality. At LG, we clearly advocate for having at least two fobs at any one time—not on your person, necessarily, but known to exist somewhere. The worst story is my own: I was down to one fob (the other turned up months later in the washing machine) and it got lost in the sands at Muir Beach. Cell phone reception at the parking lot was poor, breaking into the car was embarrassing even in my mechanics’ uniform, and a tow up the narrow switchbacks of Route 1 would have cost hundreds of dollars. I managed to extricate the vehicle, but it was a hard lesson to be sure. Keys are needed for various reasons. Loss is one, so is wear and tear, perhaps you have multiple users and needs. Fortunately the parts departments of Toyota dealers are happy to sell a virgin fob with the functionality to match a vehicle, and this is the best way to go. Initializing the keys, smart or no, is straightforward using a factory scan tool. LG charges $30 for the service. With tax, a new key costs approximately $260. This is a lot for a key, no doubt, but it’s less than a tow, a new fob (or two), and a complete reset of the theft deterrent system ($120 labor), let alone the feeling of rejection by a lovely, however high tech Prius.